Bengaluru, Feb 14 (IANS) Karnataka Assembly Speaker K.R. Ramesh Kumar adjourned the House till 3 p.m. on Thursday amid protests by BJP legislators against the attack on its MLA's residence in Hassan. The Bharatiya Janata Party (BJP) legislators walked towards the Speaker's podium and raised slogans against the attack on Preetham Gowda's residence by Janata Dal-Secular (JD-S) workers in Hassan, about 180km from here. JD-S workers had attacked Gowda's house by pelting stones on Wednesday after he allegedly bad-mouthed its supremo H.D. Deve Gowda, who represents the district in Lok Sabha. Hassan is Gowda clan's home constituency. BJP's state unit president B.S. 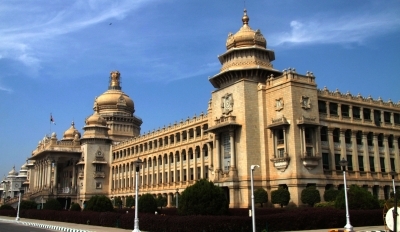 Yeddyurappa urged the Speaker for a thorough probe into the incident. "We have submitted a letter to Governor Vajubhai Vala on the stone pelting issue. Our legislator (Preetham Gowda) and his family were threatened by the JD-S workers," Yeddyurappa told the media earlier in the day. Anti-government protests by the BJP have marred the state Budget Session, which began on February 6.